The most popular flight from Denham, this flight gives a great view of the area. “Flight 2: - 40min Bargain” This flight is our most popular scenic tour. As the aircraft flies over the coastal area there are ample opportunities to see sharks, rays and turtles, perhaps even humpback whales and whale sharks in season, as well as the famous elusive dugongs which feed on the marine kelp forests. This flight crosses Freycinet Reach to the fascinating patchwork of salt ponds at Useless Loop. It then crosses the sandy finger of Bellefin Prong and out over the rugged Zuytdorp Cliffs. Following the cliffs northward to Australia's most westerly landfall at Steep Point which is separated from historic Dirk Hartog Island by the waters of South Passage passengers can observe a wide range of geological and marine formations which have contributed greatly to the areas popularity. 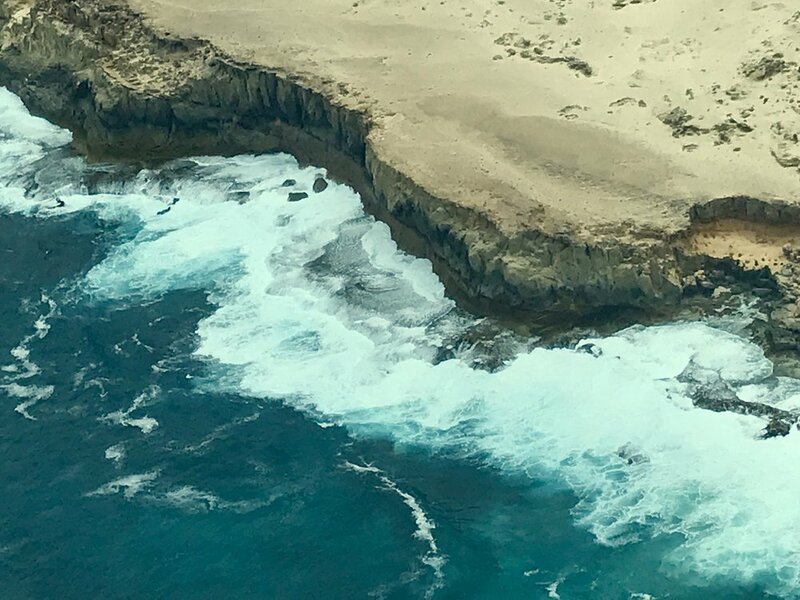 The flight crosses part of Dirk Hartog Island and continues over shallow waters and sand bars adding to the astonishing range of blues and greens hues of the area and then returns to Denham and Shark Bay airport.